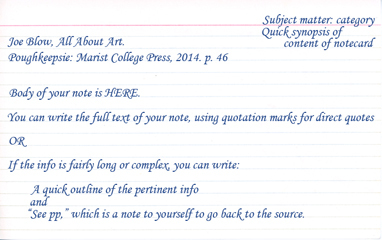 Whether your information is a paraphrase or a direct quote (an exact copy of text written by another person). If your memory is very good, it's wise to make a habit of quoting directly and indicating clearly in your notes that this is what you've done. A person with a treacherously good memory may paraphrase while taking notes and then closely reproduce the original text in his / her paper. If you're blessed with a memory of this sort, be sure to finish your paper a few days before it's due. This way, you'll be able to let it rest for a bit and then read it over and be able to say to yourself, "Oops, I've read this before..." and fix the problem. You might consider using Microsoft OneNote, which is a powerful searchable database for note taking--the basic version is now available FREE, with versions for both PC and Mac. OneNote includes a good tutorial, is available in most campus computer labs, and is part of the Microsoft Office bundle, so you may already have it on your computer. 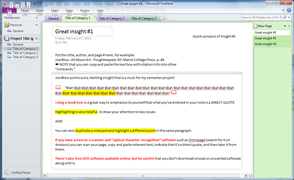 So long as you're careful to indicate in your notes when you're using a direct quote, OneNote works splendidly in conjunction with OCR (optical character recognition) software such as OmniPage that allows you to scan a source and then copy and paste text into OneNote. If the cost is challenging to your budget, there's no need to buy the latest version. A good-quality scanner is more important than the most recent software. There are also free OCR software programs available on the Internet (do a Google search for "free OCR software") but be careful not to download unwanted software or even malware at the same time. This is how sites offering free software make their money: Unless you're very careful you'll get an extra software piggybacking on the one you actually want. If you decide to stick with physical notes, use 8.5 x 11 inch notecards instead of small ones. This will give you plenty of room to include all of the info you need for each notecard. It also will help to avoid writing on the back of the card--which has the potential to drive you crazy as you look for something on the fronts of a stack of index cards when it turns out that you've written the crucial information on the back of a card. Altho it's laborious, carefully organized and written notecards will save time when you write your paper. Writing notes in a notebook or using sticky notes is OK for a small project, but for a large project using a minimum of ten to fifteen sources this quickly becomes unwieldy and will result in your wasting time looking for your notes on a specific topic.